The RAM-B-202U-GA63 consists of a 1" diameter rubber ball, connected to a custom Garmin VIRB™ camera adapter. The RAM-B-202U-GA63 by RAM Mounts consists of a 1" diameter rubber ball, connected to a custom Garmin VIRB™ camera adapter. The adapter attaches directly factory mounting bracket. Action Sports Cameras have revolutionized how we capture and share some of the most exciting moments in our lives. The Garmin VIRB™ is one of the most exciting Action Sports Cameras with almost unlimited capabilities and applications. Make the most of your VIRB™ with a full selection of RAM Mounts to support your Garmin VIRB™ in almost any application. Whether you're mounting your VIRB™ on a motorcycle, bicycle, off-road vehicle or race car, RAM has several solutions that are certain to get you the best angles possible. 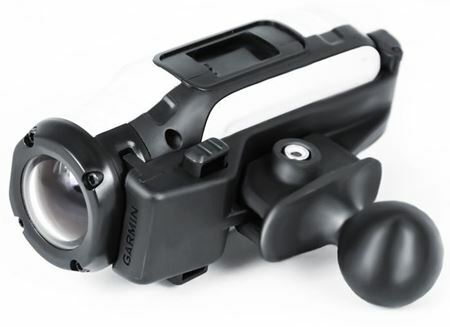 Constructed of the finest materials in the USA and built to last, RAM offers the widest selection of Garmin VIRB™ mounts available.